Tatyana Kasperovich, The Scrap Exchange’s new Volunteer Coordinator, was born in Moscow, Russia. At the age of four, her family relocated to Omaha, Nebraska, where she grew up with mid-western qualities that are evident in her accent. She has lived in North Carolina for 4 years and absolutely loves the people and activities available here. Every year, The Scrap Exchange hosts hundreds of volunteers. Last year, volunteers contributed over 13,000 hours and played a huge role in the success of the organization. 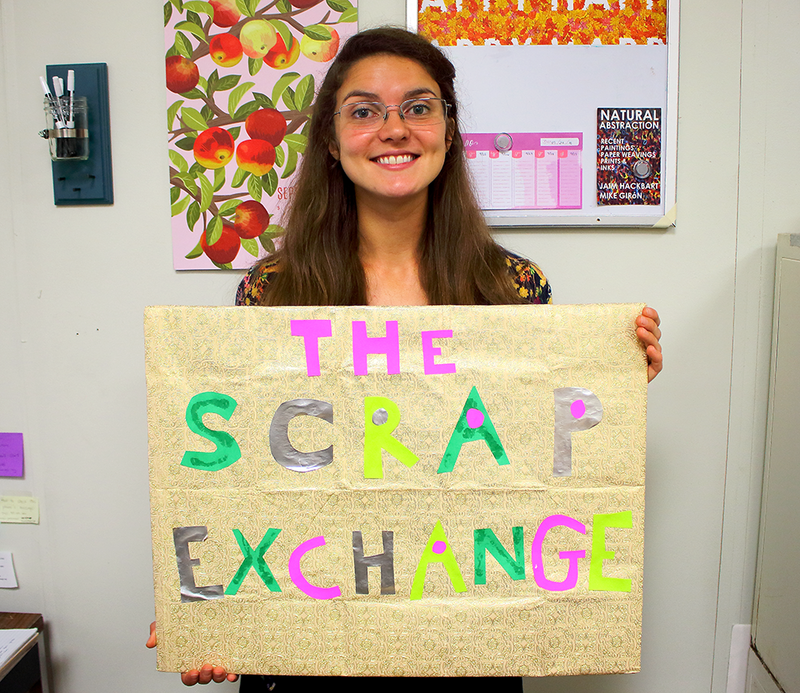 Tatyana Kasperovich’s first experience of The Scrap Exchange was as a volunteer enrolled in the UNC Apples Program. In the class titled Urban Political Geography, her coursework included a critical look at gentrification and how it is changing Durham. “What I learned in that class is always on my mind when I think about the Reuse Arts District (RAD). There are a lot of cool things going on but we need to make sure that everyone in the neighborhood will benefit from the project and not get priced out of the homes they have lived in for 30 years,” says Tatyana. Her volunteer stint with UNC Apples lasted 6 months and she was so inspired by the experience that she continued to volunteer when it ended. A few months later when she graduated, store manager Jeff Zern offered her a job, which she happily accepted. She joined the staff in processing and quickly progressed to cashier and hosting the greeter’s desk. Once comfortable with each area of the store, she began assisting with volunteers where her own experience greatly informed how she related to their individual needs, concerns and ideas. Tatyana continued in her role for 2 years before taking a travel break in early 2018 to explore England, Ireland, Norway and the Czech Republic. This fall Tatyana rejoined the staff as the Volunteer Coordinator, an administrative position that utilizes her background in both aspects of the volunteer experience. And she has really hit the ground running! Her immediate goals are to increase new volunteer outreach; revise scheduling and documentation procedures; and develop projects that benefit both the organization and the needs of the volunteers. “My major focus is to really open up communication at both stores so they will know when volunteers are scheduled, especially the large groups. I will also work with the staff to provide projects that utilize that time wisely,” she says. Tatyana’s duties also include workforce development programs like NCBA and ReEmployability that help people re-enter the workforce. “One thing I am super excited about is our intern program. I want to completely revamp that and make it more hands-on by checking in with the interns every week, seeing where they are on projects and relating that work back to real life skills to make it more meaningful for them,” she explains. The expanded focus on the intern program will launch this Spring. The evolution of Tatyana’s career at The Scrap Exchange is a direct result of her eagerness to learn, her commitment to her work and her positive relationships with customers and co-workers. She is a cheerful, outgoing person that lights up a room with her presence and infectious laugh. “The Scrap Exchange has taught me so much. I love how you can learn about hardware one day, what companies in RTP manufacture another day, and the importance of people skills and life in general the next day. It has made me a well-rounded person, increased my life skills and even taught me the difference between Gorilla Glue and regular glue,” she says laughing. “We have a lot of very environmentally conscious people working and shopping here so I learn new things every day.” But Tatyana also wants people to know that despite her outward ease with people, she still gets socially nervous and works very hard to overcome that obstacle. “I want people to know that I am very open to talking to people about anything! Whether they just need to vent, solve a problem, or even discuss a movie that no one else cares about! My door is open and I would love to talk with them,” she explains. In her off hours, Tatyana operates a dog sitting/dog walking business called Kasper and Friends Pet Sitting Service. She truly loves spending time with animals and I highly recommend her service. I am pretty sure that my own dogs would pick her over me any day! Kindred reuse/recycling spirits are drawn together. The Scrap Exchange and our electronics recycling partner, Triangle Ecycling (TE) have been together for more than 6 years collecting, sharing and supporting each other and our customers. They recycle electronics we collect and we take everything non-electronic they collect. They also have donated computers for Scrap Exchange staff through their TEKI Program which supports nonprofits that work with children in education. And TEKI is just one way they give back to the community. TE’s operation, in Durham’s old Pepsi Plant, employees 10 computer techs. Their E-Scholar Program will be admitting its 100th Durham Public Schools intern this fall. 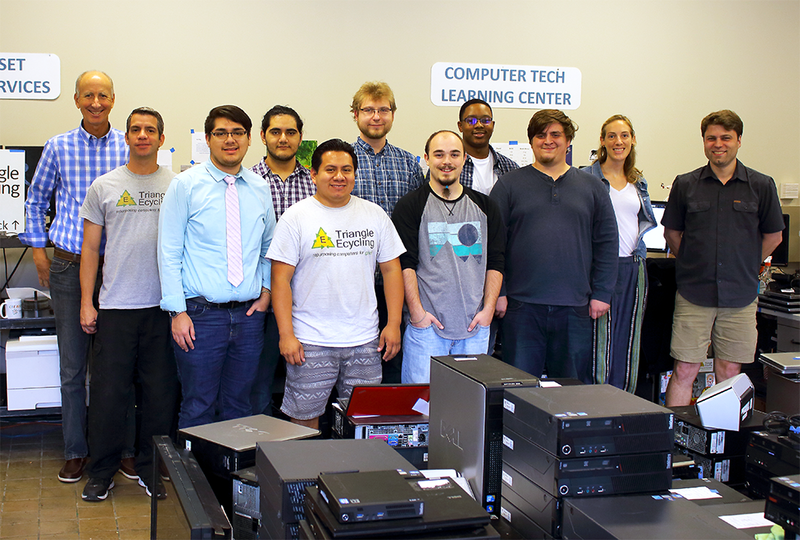 These interns spend an entire semester learning computer refurbishing, recycling and the soft skills so necessary for finding a good job upon graduation. They also learn the importance of a small business giving back to its community. The Scrap Exchange accepts computers, cell phones and small computer peripherals for recycling on behalf of TE or you can drop off with them at 2717 Western Bypass, Durham 9:30-5 on weekdays. And while you’re there, check out their great offering of low price laptops and desktops – PC and Apple. 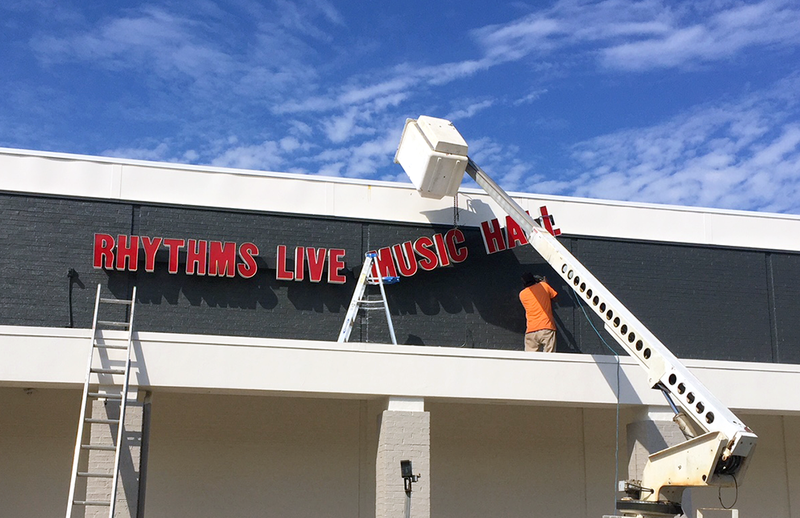 The Scrap Exchange is thrilled to announce the newest addition to the Reuse Arts District, the Rhythm’s Live Music Hall! Now in the final phases of construction, the 14,000 square foot space next to Scrap Thrift will soon become a premium destination for music lovers in the Triangle. Owned and operated by Victor and Jerre Graham, the new facility features an incredible sound system designed by Rick Camp, a studio engineer with credits that range from mixing and touring with artists such as Earth, Wind & Fire, Destiny’s Child and Beyoncé, Natalie Cole, Burt Bacharach, Kelly Clarkson, Fantasia, Jennifer Lopez, Mary J. Blige, Chris Brown, Kenny “Babyface” Edmonds, Brandy, and New Edition, to name a few. 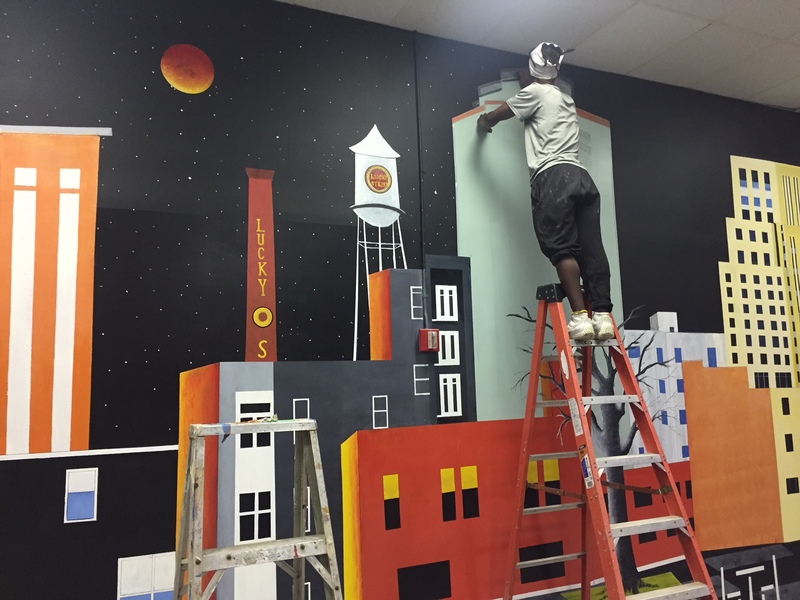 Gracing the entire front wall of the venue is a mural of Durham by artist Baede Minasse, (shown below). Victor has already lined up several incredible acts and plans to be fully operational by December. Stop by our SmashFest event on November 23rd and take a tour of the new venue. AND, if you are looking for a new place to ring in the New Year, look no further than the Lakewood Shopping Center! Victor and Jerre are gonna ROCK your socks off!